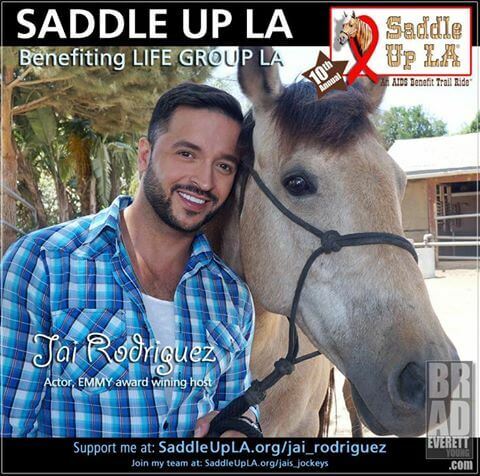 This year celebrates the 10th annual Saddle Up LA: an AIDS Benefit trail ride and BBQ. Once again Emmy winning actor and Broadway star, Jai Rodriguez from Bravo’s Queer Eye & ABC’s Malibu Country will be the events Honorary Trail Guide! The Life Group L.A. presents its Award Winning, 10th Annual “Saddle Up LA.” (www.SaddleUpLA.org). An AIDS Benefit Horseback Trail Ride and Country BBQ which will be held Saturday July 11th in the Beautiful and Majestic Griffith Park Mountains. If you don’t have your own horse, not a problem, 75 horses are being made available on a first come first reserved basis but you do not have to ride, you can come to the BBQ! Registration is open now for those who want to sign up for the event and help raise money. The goal of this years’ event is $100,000. All money raised helps the continuation of The Life Group’s work. The purpose of the ride is to raise awareness of the fact that the AIDS. Pandemic is not over and to raise much needed funds for the HIV services provided by The Life Group LA. It is also an affirmation of the power of compassion and a demonstration that ordinary people can accomplish extraordinary things. Founded in 2005, The Life Group LA provides education, empowerment and emotional support to persons infected and affected by HIV/AIDS that they may make informed choices regarding their healthcare and personal well being. Using a variety of methodologies such as peer support groups and the POZ Life Weekend Seminar, The Life Group LA creates educational and empowering experiences in a safe, confidential and non-judgmental environment. Saddle up LA 2014 will be another ride to remember! It will honor not only those who have died of AIDS but will honor those of us who live on whether infected or affected by HIV. For more information regarding Saddle Up LA 2014 the Ride, the BBQ or Sponsorship Opportunities, please visit our website at www.SaddleUpLA.org or contact Sunnie Rose at 888-208-8081 email at sunnie@thelifegroupla.org. Saddle Up LA won 2006, 2009 and 2010 Weho Awards for Outstanding Community Event!